The San Diego Regional Urban Forests Council is a member-driven coalition of businesses, agencies and educators that are dedicated to planting and preserving urban trees in our region by offering public bi-monthly meetings and website full of information. Trees can be the most expensive part of a landscape in terms of care but they also provide economic, social and environmental benefits. 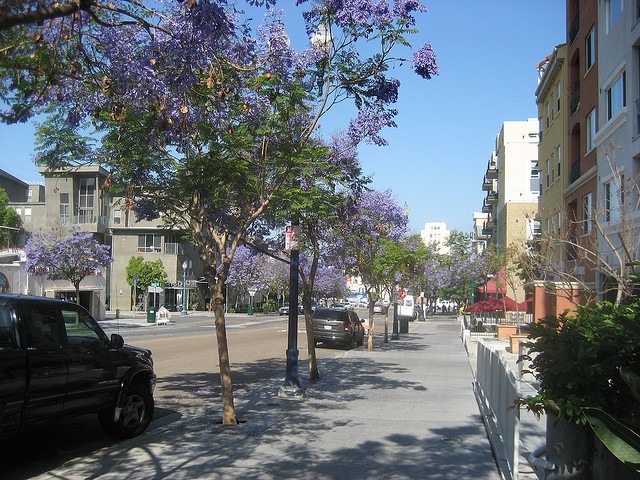 The Council’s list of recommended drought-tolerant trees that are appropriate for the San Diego region takes into account the amount of storm water intercepted, carbon stored and energy savings each one provides at maturity (for exact numbers, please see their tree care document). At the end of the day, trees chosen need to meet aesthetic and growing habit requirements so we’ll show you what they look like and outline what to expect. Then, refer to our guide for how to take care of trees during drought. The Australian willow is often called a wilga tree or native willow. As the name implies, it’s native to eastern Australia. The evergreen tree is known for drooping branches and leaves and can reach heights of up to 35′ and a width of about 30′. These trees hold up well in areas with high winds and blossom cream-colored flowers in the spring that give off what is described as a citrus-like or musky aroma. 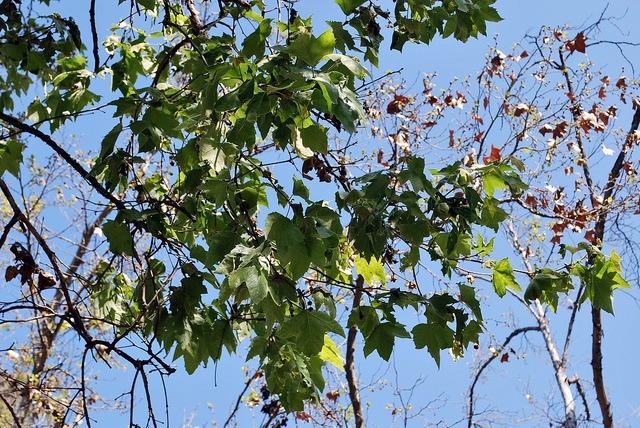 You’ll need plenty of space for this beauty as a California sycamore tree can reach heights of 75′! Not to mention a big rake might be in order as it’s also deciduous. The leaves turn color in the fall and drop making it a good choice for those who want to experience a change of seasons in their own backyard. In the wild, you’ll find it along the coastal foothills. This pretty tree is also good in heat, wind and clay soil, but is only drought-tolerant in when established in moderate coastal temperatures. Likely due to its size, the amount of storm water its able to intercept is drastically higher than other trees on this list. 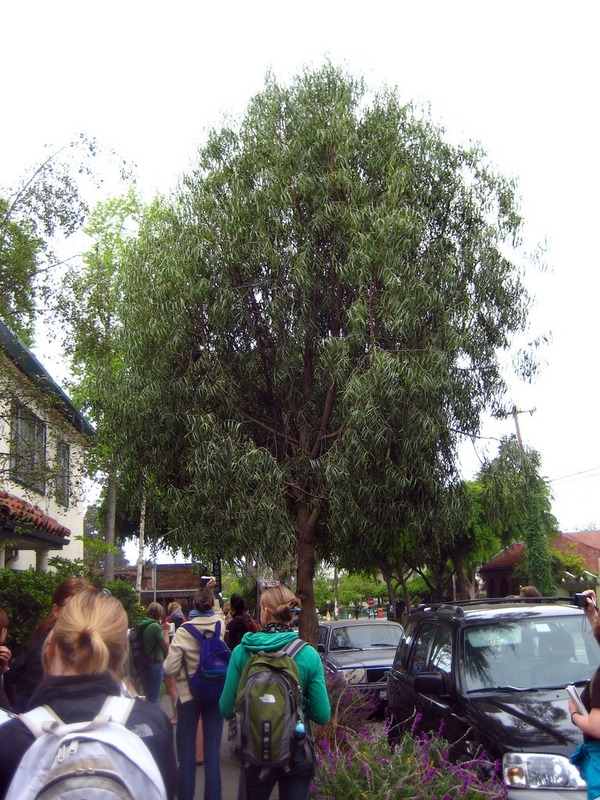 This makes an excellent urban tree because it’s tall (70-80′), provides filtered shade, and grows rather narrow. The Canary Island pine requires little care as it is self-pruning because it drops its own needles. Roots are deep so its great for lawns, near paver patios and other spots that might be interrupted by growing roots. This helpful video does an excellent job of describing the tree’s characteristics. Crape myrtle is a beautiful tree that blooms white, pink, red or purple flowers from summer through fall. 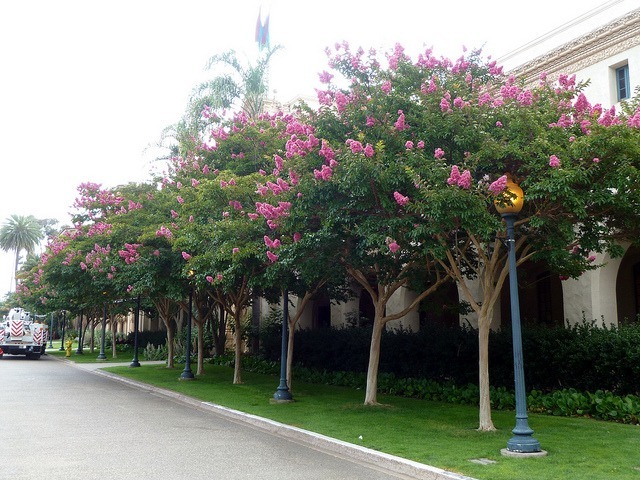 The above photo is of crape myrtle trees planted in Balboa Park. Gardeners also particularly like the grey-brown trunks, the fact that these trees survive with neglect and the lack of pruning. Heights average about 15-20 feet. 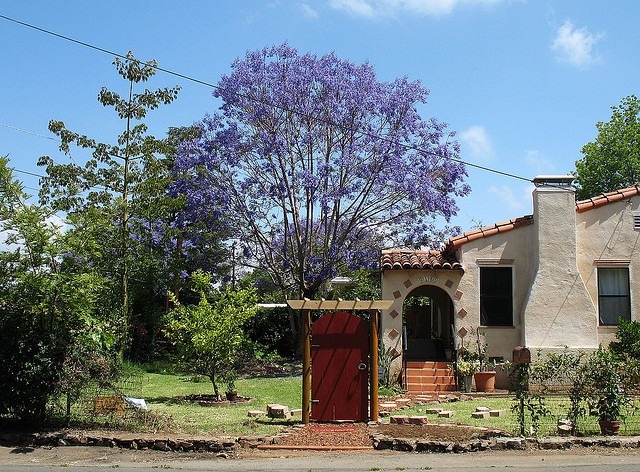 Find jacaranda trees all over San Diego county as they are unmistakable when the stunning purple flowers are in bloom. Even the San Diego Botanic Garden describes them as “among the world’s most spectacular flowering trees with lavender blue, tubular blooms in late spring and early summer.” These trees grow 40-50′ tall and wide. Also known as the paperbark tree, the Melaleuca tree grows a crown of dense dark green leave which grows umbrella-like. Young trees such as the one above look a bit more willowy. 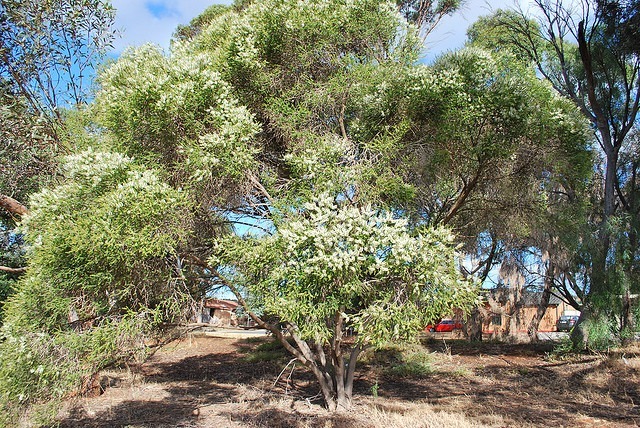 Small, white flowers appear in summer and cover what might seem to be the entire tree. This and its white-colored bark result in its other common name: snow-in-summer. Melaleuca grows to 30′ tall and 20′ wide. 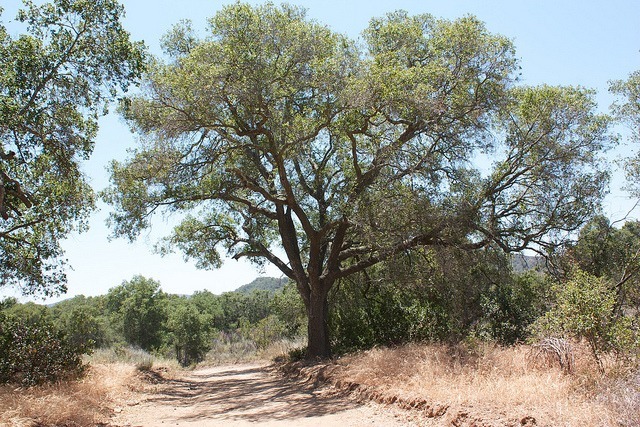 The coast live oak tree is native to Baja and California. It will be worth the care required in the first few years after planting because, at maturity, this tree absorbs significantly more carbon than the rest on this list. They grow up to 60′ tall and 50′ wide (but usually average smaller than this) and the crown spread often exceeds its height. The network of branches are crooked and vary in diameter. When the leaves of this evergreen tree are crushed, they smell like peppermint. It’s a fast-growing tree to 35-35′ tall that tolerates wind well but does prefer well-draining soil and occasional deep watering. It is recommended for use in lawns and for curbside plantings as roots are not likely to disrupt nearby hardscape. 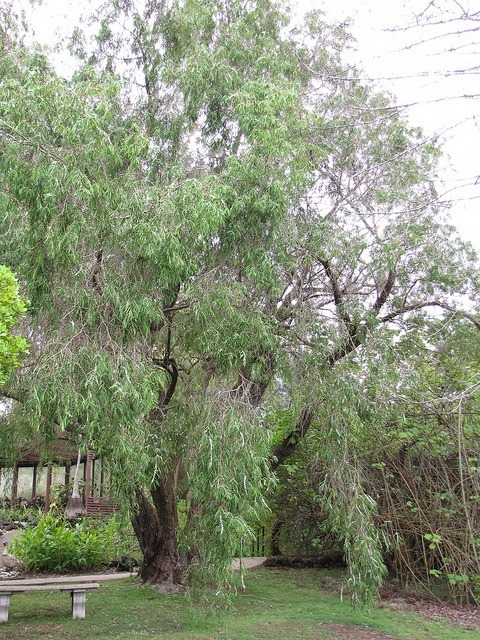 The peppermint tree is often confused with the Australian Willow, also on this list which is similar in look. Here’s another pretty tree that you’ve probably seen around San Diego. The delicate deep pink/purple flowers decorate bare branches stemming from multiple trunks in the spring though it’s possible to prune it into a single-trunk tree. The pale-green heart-shaped foliage appears after the flowers and turn yellow before dropping in the fall. 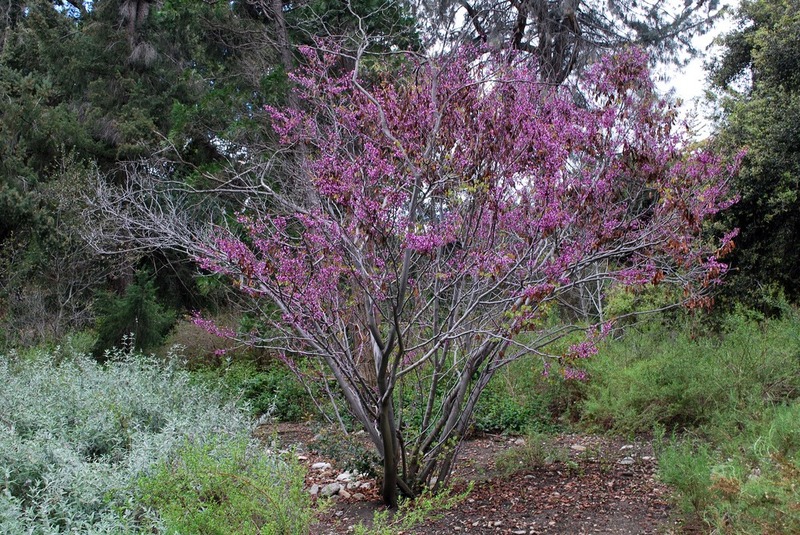 The Western redbud grows to about 15′ tall which is perfect for homes with height restrictions. 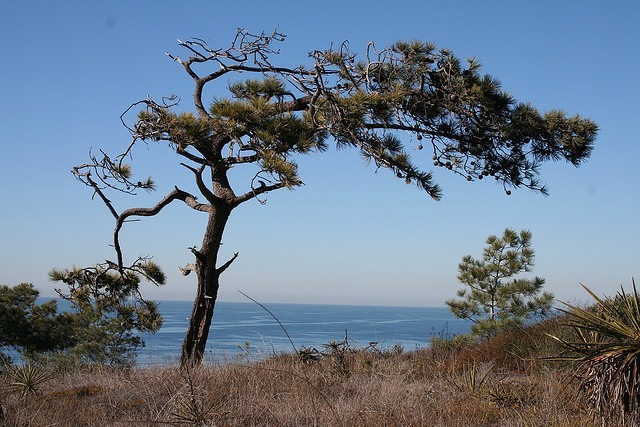 The prized Torrey Pine tree can actually be grown at home. In fact, local arborists encouraged those who have the space for it to plant this rare conifer. San Diego is one of the only two places (the other being Santa Rosa island) where it still grows in the wild. The needles are a grey-green color and the tree reaches heights of up to 40′. Check city ordinances for tree requirements in your neighborhood. However, the San Diego Regional Urban Forests Council lists a few recommendations to eliminate interruption of important sight lines. to permit lines of sight as detailed by local ordinances. 14′ above curbs or edge of the traveled way. Which drought-tolerant trees would you recommend for our area?